Kidneys filter out the waste from the bloodstream. Kidney stones form when minerals, such as calcium, uric acid, and oxalate in the urine, are in a concentrated form. Using apple cider vinegar for kidney stones has been touted as one of the most potent remedies. Kidney stones cause a lot of discomfort and pain in the stomach, groin, or lower back. Usually, medications and surgery are treatments used to remove kidney stones. Those who want to avoid surgery or drugs can adopt some simple home remedies, one of which is apple cider vinegar. Fermented apples are used to make apple cider vinegar (ACV). You can use a combination of lemon, olive oil and apple cider vinegar for kidney stones. Apple cider vinegar and cranberry juice for kidney stones is also a good remedy. How Does Apple Cider Vinegar Work to Treat Kidney Stones? ACV is acidic and helps break down the hard tissues that form kidney stones. If the stones are small, ACV helps to flush them out of the body during urination. The larger stones get dissolved over a period of time if you consume ACV regularly. Consuming ACV treats kidney stones and prevents the recurrence of it. It acts as a natural cleanser. The use of ACV for kidney stones lacks scientific evidence; however, many people use this as a home remedy. ACV helps break down uric acid, calcium, and oxalate. Despite being acidic, ACV has an alkalinizing effect on the urine and blood, and assists the digestive process. ACV reduces the acid-forming components in the body, preventing the risk of kidney stones. 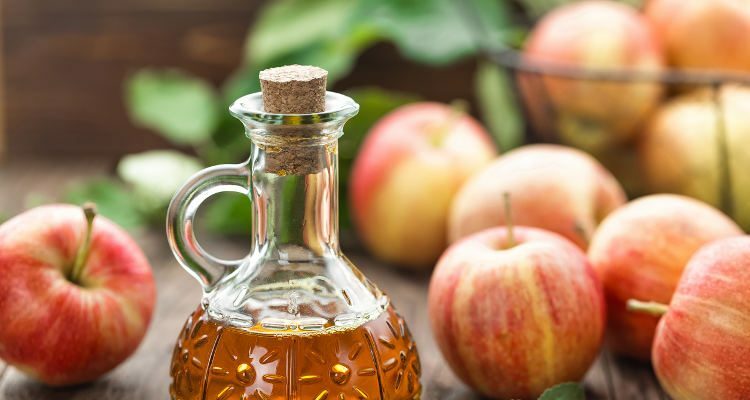 Let’s take a look and see how to use apple cider vinegar for kidney stones. In a bowl, mix two teaspoons of honey with a teaspoon of ACV. Drink this mixture throughout the day. Repeat this process until the kidney stone dissolves. You can also add some water to the concoction. Take six to eight ounces of water. Add two tablespoons of ACV to it. Mix it well and drink it throughout the day. Drinking this mixture before meals will help prevent kidney stones buildup. Even after the kidney stones are eliminated, you should drink this mixture once or twice every week to avoid the recurrence of stones. Apple cider vinegar and baking soda for kidney stones is a good prevention remedy. Baking soda has alkalizing properties which decrease the acidity in the body. Simply mix a couple of tablespoons of ACV and half a teaspoon of baking soda. Drink the mixture once it stops fizzing and be sure to do this three times daily until you get relief. Apple cider vinegar and lemon juice for kidney stones is also beneficial. Lemon contains citric acid. This component decreases the acidity of urine and prevents kidney stone formation. Mix two ounces of organic lemon juice and two ounces of organic olive oil. Drink this mixture followed by 12 ounces of water, and wait an hour before consuming anything. You can also squeeze the juice of half a lemon in 12 ounces of water, and add a tablespoon of ACV to it. Mix it well and drink it. Repeat this process the for the entire day until the stone dissolves. In a pan, heat equal quantities of ACV and water. Soak a washcloth in the mixture for few minutes. Then, remove the excess liquid from the cloth. Place the cloth on the painful areas until it cools. Repeat the process until you get relief from the pain. Mix two tablespoons of apple cider vinegar and coconut oil with 16 ounces of water. Drink this blend to prevent kidney stones. Fill a large mug with hot distilled water. Add an ounce of ACV to it with one-fourth of a teaspoon of baking soda and honey. Stir well and drink it in 30 minutes. This method will relieve the pain caused due to kidney stones. How Much Apple Cider Vinegar to Drink for Kidney Stones? The quantity of apple cider vinegar for kidney stones depends on many factors. These factors include the size and severity of pain, as well as how long they have been in existence. ACV helps to dissolve the kidney stones by breaking them down and flushing them out through the urine. It also helps flush out the minerals that form kidney stones. You should consume ACV regularly to prevent the formation of kidney stones, or to get relief from this condition. Add two tablespoons of the vinegar in an eight-ounce glass of water and drink it once a day. Consuming the correct quantity of ACV helps get relief from kidney stone pain in 24 to 48 hours. You can topically apply ACV to the affected area. For this, you need to soak a cloth in warm ACV and place it on the affected area. The topical application of ACV may help dissolve kidney stones gradually. However, this method is more potent when paired with consuming ACV internally. There are a few other alternatives to ACV for treating kidney stones. Taking 500 milligrams of dandelion root twice a day may help treat kidney stones. It cleanses the kidneys and supports normal kidney function. According to the University of Maryland Medical Center, eating high-fiber foods, such as kidney beans, can help treat kidney stones. Apart from Apple cider vinegar for kidney stones, Nettle is another good option, as it is a powerful diuretic that has antibacterial properties. Consuming two to three cups of nettle leaf tea may flush out stone-forming minerals from the kidneys. It will also prevent the formation of new stones, as well as stop the growth of existing stones. Nettle leaf tea helps prevent urinary tract infections. According to the Journal of Endourology, drinking pomegranate juice prevents the formation of kidney stones. Having a cup or two of this juice helps relieve kidney stone pain. Pomegranate juice is full of free radical-fighting antioxidants. A teaspoon each of basil juice and raw honey helps dissolve kidney stones. You should take this mixture daily for six months. You can also drink basil tea to maintain uric acid balance in the body. 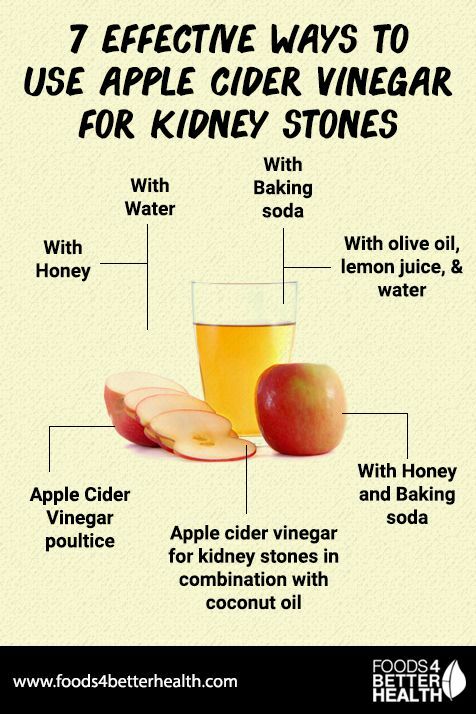 Consuming apple cider vinegar for kidney stones is a good option, but you should take preventive measures as well. According to a study published in the Clinical Journal of the American Society of Nephrology, consuming sugar-sweetened soda increases the risk of kidney stone formation. You also need to live an overall good lifestyle that includes a balanced diet and exercise, if you want home remedies such as ACV to help. In conclusion, you can drink ACV as a home remedy as long as you take other precautions, adhere to the lifestyle and diet recommended by your doctor, and you do not overdo the treatment. Group, E., “10 Natural Remedies for Kidney Stones,” Global Healing Center, March 14, 2017; http://www.globalhealingcenter.com/natural-health/remedies-for-kidney-stones/#1.